from Frostburg State University (1979) Frostburg, MD, GPA 3.75. 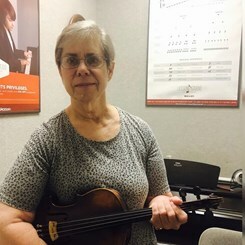 She has experience in Suzuki violin/viola methods and personal methods developed from 40 years experience. Laura was also a member of Montomery County, MD youth orchestra and Prince William Symphony. Request Lessons with Laura Hammel today!